For new employees who have provided a P45 from previous employment, a P45 Part 3 can be submitted to ROS , in order to register the new employee. For new employees commencing mid-year who do not provide their new employer with a P45, a P46 can be completed and submitted to ROS instead. The submission of a P46 or P45 Part 3 to Revenue will result in Revenue issuing a P2C/Tax Credit Certificate to the new employer for their new employee(s) via ROS. For assistance with preparing a ROS P45 Part 3 file in BrightPay, click here. 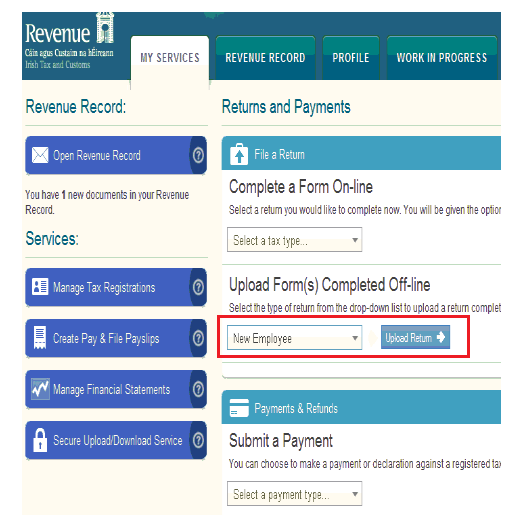 For assistance with preparing a ROS P46 file in BrightPay, click here. Once successfully submitted, confirmation will display on screen accompanied by a confirmation number for the submission.